It’s hard to believe we have now been operating as “Mitchell’s Realty Hervey Bay” for almost 6 months and we are so grateful for the support our local community has shown us. We have listed 66 properties since the 5th of January 2016 and written 19 contracts for a total value of $6,415,500- Congratulation to both our clients and the new home owners. We have experience strong buyer enquiry on properties up to $400,000- and seen a number of investors back in our local market taking advantage of the low interest rates and strong rental demand. It will be interesting to see what effect the end of the “ $12,000- Destination Hervey Bay grant “ has once finished as scheduled for the end of this month as it has definitely driven sales of new homes in the eligible estates. We also have a federal election scheduled for the 2nd of July and this month also bring with it the end of another financial year for most – so it is going to a busy month ! We’ll now hand you over to the crew at Herron & Todd white for their Month in review. Here we are – a work in progress. It’s a painting with the outline sketched, ready for the hue’s and shades to fill in their spaces and point us toward a glorious ending set to fire up the nation’s enthusiasm for property – or so it should be. Unlike the end of the annum, when December brings a sense of hitting the reset button in preparation for the next 365 days, June says, “Take a knee and let’s see what we can do to bring this thing impressively home.” Unfortunately for all those who’d been hoping for a sense of excitement in the air, this financial year’s start brings with it a Federal Election to deal with. Many in the media are calling it a long, drawn-out affair with all the excitement of sloths having a slow race through treacle. It’s a historic reality that when elections are called for the running of our country, property activity slows – but for what reason it’s hard to pinpoint. Sure, negative gearing is a big debate in this upcoming poll, but the election of either party is unlikely to bring the fall of the empire. We are a stable democracy that has yet to come under the spell of a dictatorship, so standing back and waiting for a result before you buy or sell seems, for the most part, pointless. There’s also issues beyond just deciding who gets a bed in The Lodge. Unemployment numbers, manufacturing woes, mining hangovers and a general downturn in a once booming property market are all playing their part across the country. 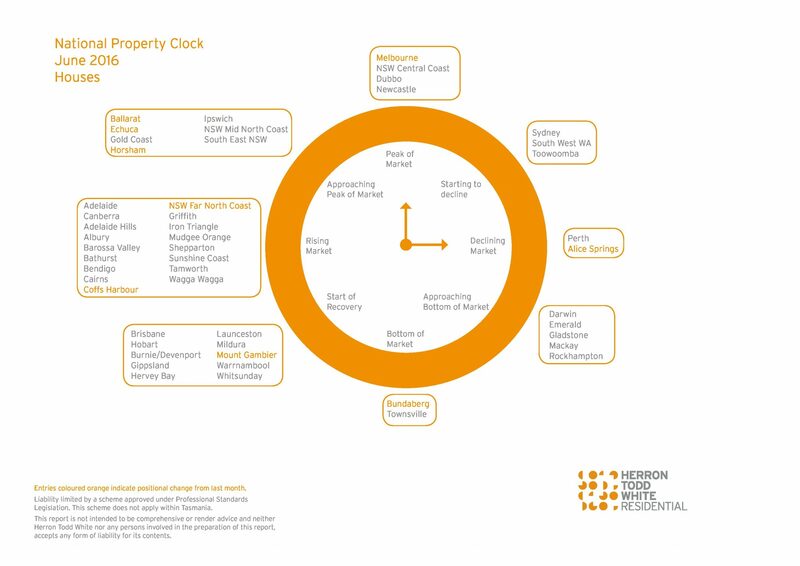 To demonstrate just how diverse our nation and its property is, we’ve called upon the clever folk at Herron Todd White throughout the nation to tell us how their markets are tracking now we’ve hit the half way point of the year. There is nothing that can replace the on-the-ground experience of a local, independent professional… and we’ve got a company full of them! No matter where you are, from coast-to coast, there’s a valuer at our firm who knows your bit of geography like it’s their own kingdom. 1. A chance to take a breather from running so many tries over in the first half. 2. An opportunity to collectively agree we’ll take our foot off the brake and romp home in a come-from behind win. We maroons thrive of being underrated and then over preforming, and it’s hoped this will translate into our property market as 2016 progresses. Now is the opportunity to take stock and see how we’re tracking. 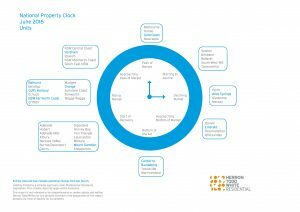 NOTE both clocks now have Hervey Bay positioned at the “Start of Recovery” for houses and units which is a great indicator ! Based on our market research from 1 October 2015 to 31 March 2016, the median price for property in Hervey Bay on an allotment size not greater than 1,500 square metres is $320,000. This is an increase of $10,000 for the same period 12 months ago. The average price for the period is $329,199 compared to $316,697 for the same period last year. The volume of sales is lower by approximately 83 sales which could be a result of not all 2016 sales being recorded. 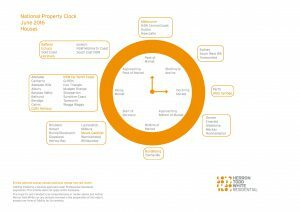 Entry level property is continuing to be affected by house and land package deals creating a price ceiling for existing, established stock. 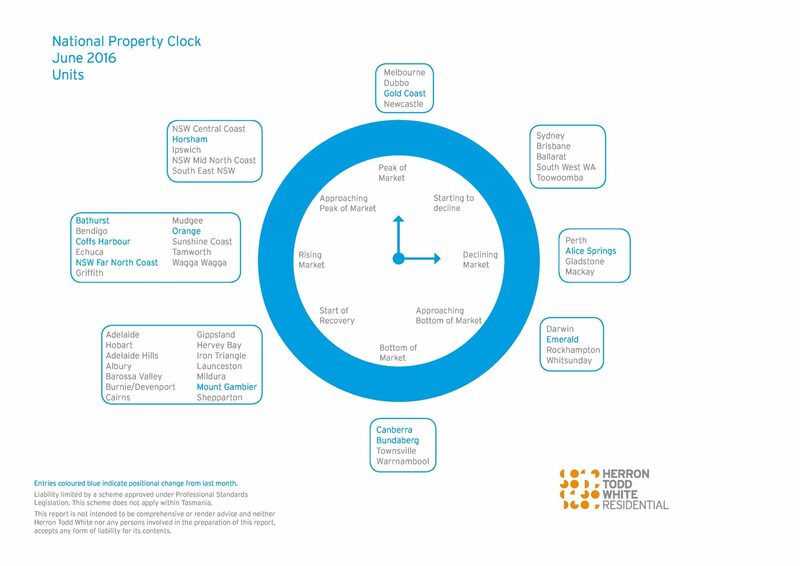 Developers continue to supply product with approximately eight estates releasing further stages. Until stock levels decline, there is likely to be limited growth in this market. The end of the $12,000 grant for new land or new house and land packages under the Building Better Regional Cities Program grant on 30 June 2016 may see some slowdown in sales rates for the eligible estates. Rental demand appears to have stabilised after a period of growth, however supply remains tight. Generally a new 4-bedroom, 2-bathroom home can achieve in the range of $350 to $370 per week rent. There appears to be increasing confidence in the higher priced market with approximately 25 settled sales over $600,000 since 1 October 2015. We are also aware of a recent contract at $1 million for a Dundowran Beach property and another at $940,000 for an Esplanade property in Urangan.